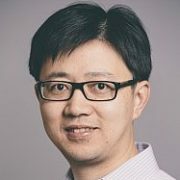 Cha Zhang is a Principal Researcher in the Project MIX Group at Microsoft Research (Redmond, WA). He received the B.S. and M.S. degrees from Tsinghua University, Beijing, China in 1998 and 2000, respectively, both in Electronic Engineering, and the Ph.D. degree in Electrical and Computer Engineering from Carnegie Mellon University, in 2004. His current research focuses on applying various machine learning and computer graphics/computer vision techniques to multimedia applications, in particular, multimedia teleconferencing. During his graduate studies at CMU, he worked on various multimedia related projects including sampling and compression of image-based rendering data, 3D model database retrieval and active learning for database annotation, peer-to-peer networking, etc. Dr. Zhang has published more than 40 technical papers and holds 10+ U.S. patents. He won the best paper award at ICME 2007, the top 10% award at MMSP 2009, and the best student paper award at ICME 2010. He co-authored two books titled “Light Field Sampling” and “Boosting-Based Face Detection and Adaptation”, published by Morgan and Claypool in 2006 and 2010, respectively. Dr. Zhang is a Senior Member of IEEE. He was the Publicity Chair for International Packet Video Workshop in 2002, the Program Co-Chair for the first Immersive Telecommunication Conference (IMMERSCOM) in 2007, the Steering Committee Co-Chair and Publicity Chair for IMMERSCOM 2009, the Program Co-Chair for the ACM Workshop on Media Data Integration (in conjunction with ACM Multimedia 2009), the Poster&Demo Chair for ICME 2011, and the Program Co-Chair for VCIP 2012 . He served as TPC members for many conferences including ACM Multimedia, CVPR, ICCV, ECCV, MMSP, ICME, ICPR, ICWL, etc. He currently serves as an Associate Editor for Journal of Distance Education Technologies, IPSJ Transactions on Computer Vision and Applications, and ICST Transactions on Immersive Telecommunications. He was a guest editor for Advances in Multimedia, Special Issue on Multimedia Immersive Technologies and Networking. Ph.D. in Electrical and Computer Engineering, Carnegie Mellon University, 2004. M.S. in Electrical Engineering, Tsinghua University, 2000. B.S. in Electrical Engineering, Tsinghua University, 1998. B.S. graduated with the highest honor, Tsinghua University. Best M.S. thesis, Tsinghua University. Best paper award, IEEE International Conference on Multimedia & Expo 2007. Top 10% award, IEEE International Workshop on Multimedia Signal Processing 2009. Best student paper award, IEEE International Conference on Multimedia & Expo 2010. Associate Editor, IEEE Transactions on Circuits and Systems for Video Technology. Associate Editor, IEEE Transactions on Multimedia. TC member, IEEE Signal Processing Society Multimedia Signal Processing Technical Committee and Multimedia Communications Technical Committee. Program Committee Member, ICIP 2014, Paris, France, Oct. 2014. Publications Chair, MMSP 2014, Jakarta, Indonesia, Sep. 2014. Associate Editor, ICPR 2014, Stockholm, Sweden, Aug. 2014. Program Committee Member, ISCAS 2014, Melbourne, Australia, Jun. 2014. Program Committee Member, ICASSP 2014, Florence, Italy, May 2014. Program Committee Member, MMSys 2014, Singapore, Mar. 2014. Program Committee Member, WACV 2014, Steamboat Springs, CO, Mar. 2014. Program Committee Member, MMM 2014, Dublin, Ireland, Jan. 2014. Vice-Chair, 3D Rendering, Processing and Communications Interest Group, MMTC. Program Committee Member, Packet Video Workshop 2013, San Jose, Dec. 2013.
Review Committee Member, ICCV 2013, Sydney, Australia, Dec. 2013. Program Committee Member, ICIP 2013, Melbourne, Australia, Sep. 2013. Program Committee Member, MMSP 2013, Pula, Italy, Sep. 2013. Organization Committee, Hot3D 2013 in conjunction with ICME 2013, San Jose, Jul. 2013. Industry Program Co-Chair, ICME 2013, San Jose, Jul. 2013. Program Committee Member, CVPR 2013, Portland, Jun. 2013. Program Committee Member, ICASSP 2013, Vancouver, Canada, May 2013. Program Committee Member, ISCAS 2013, Beijing, China, May 2013. Program Committee Member, FG 2013, Shanghai, China, Apr. 2013. Program Committee Member, MMM 2013, Huangshan, China, Jan. 2013. Program Co-Chair, VCIP 2012, San Diego, CA, Nov. 2012.
Review Committee Member, ACCV 2012, Daejeon, Korea, Nov. 2012. Guest Editor, IEEE Multimedia Magazine, Special issue on 3D Imaging Techniques and Multimedia Applications. Area Chair, ICPR 2012, Tsukuba, Japan, Nov. 2012. Program Committee Member, CDC4CV 2012 in conjunction with ECCV 2012, Firenze, Italy, Oct. 2012. Program Committee Member, MMSP 2012, Banff, Canada, Sep. 2012. Track Chair, ICME 2012, Melbourne, Australia, Jul. 2012. Workshop Co-Chair, ICME 2012 workshop on Human-Focused Communications in the 3D Continuum, Melbourne, Australia, Jul. 2012. Program Committee Member, CVPR 2012, Rhode Island, Jun. 2012. Program Committee Member, WACV 2012, Colorado, CO, Jan. 2012. Associate Editor, IPSJ Transactions on Computer Vision and Applications. Program Committee Member, The 3rd Workshop on Use of Context in Video Processing, Alicante, Spain, Nov. 2011. Program Committee Member, ICCV 2011, Barcelona, Spain, Nov. 2011. Program Committee Member, ACM Multimedia, Scottsdale, AZ, Nov. 2011. Program Committee Member, MMSP 2011, Hangzhou, China, Oct. 2011. Program Committee Member, ICIP 2011, Brussels, Belguim, Sep. 2011. Program Committee Member, ICIG 2011, Anhui, China, Aug. 2011. Poster & Demo Co-Chair and Industrial Program Co-Chair, ICME 2011, Barcelona, Spain, Jul. 2011. Steering Committee Member, International Workshop on Hot Topics in 3D, in conjunction with ICME 2011. Program Committee Member, CVPR 2011, Colorado Springs, CO, Jun. 2011. Program Committee Member, FG 2011, Santa Barbara, CA, Mar. 2011. Program Committee Member, WACV 2011, Kona, Hawaii, Jan. 2011. Program Committee Member, Packet Video 2010, Hong Kong, China, Dec. 2010. Program Committee Member, ACCV 2010, Queenstown, New Zealand, Nov. 2010. Reviewer, ECCV 2010, Crete, Greece, Sep. 2010. Program Committee Member, U-Media 2010, Jinhua, Zhejing, China, Jul. 2010. Program Committee Member, 3DTV-CON 2010, Tampere, Finland, Jun. 2010. Program Committee Member, ICME 2010, Singapore, Jul. 2010. Organizing Committee Member, International Workshop on Hot Topics in 3D, in conjunction with ICME 2010. Program Committee Member, ACM Multimedia 2010, Firenze, Italy, Oct. 2010. Program Committee Member, CVPR 2010, San Francisco, CA, USA, Jun. 2010. Program Committee Member, AMFG 2010, in conjunction with CVPR 2010. Program Committee Member, MIR 2010, Philadelphia, PA, USA, Mar. 2010. Program Committee Member, MMM 2010, Chongqing, China, Jan. 2010. Program Co-Chair, ACM Workshop on Media Data Integration, in conjunction with ACM Multimedia 2009, Beijing, Oct. 2009. Reviewer, ICCV 2009, Kyoto, Japan, Sep. 2009. Program Committee Member, ICIG 2009, Xi’an, China, Sep 2009. Program Committee Member, ICME 2009, Cancun, Mexico, Jun. 2009. Program Committee Member, CVPR 2009, Florida, USA, Jun. 2009.
Review Committee Member, 3DTV-CON 2009, Potsdam, Germany, May 2009. Scientific Committee Member, MIRAGE 2009, Paris, May 2009. Program Committee Member, ICMCS 2009, Ouarzazate, Morocco, Apr. 2009. Steering Committee and TPC Member, Publicity Chair, IMMERSCOM 2009, Berkeley, CA, May 2009. Associate Editor, Journal of Distance Education Technologies. Guest Editor, Advances in Multimedia, Speical Issue on Multimedia Immersive Technologies and Networking. Program Committee Member, Australia Video Conference (AusVideo 2008), Brisbane, Australia, Oct. 2008. Program Committee Member, ECCV 2008 Workshop on Fast and Robust Methods for Multiple-view Vision, Marseille, France, Oct. 2008. Program Committee Member, ECCV 2008, Marseille, France, Oct. 2008. Program Committee Member, ICWL 2008, Zhejiang, China, Aug. 2008. Program Committee Member, KES IIMSS 2008, Piraeus-Athens, Greece, Jul. 2008. Reviewer for ICME 2008, Hannover, Germany, Jun. 2008. Program Committee Member, CVPR 2008, Anchorage, Alaska, USA, Jun. 2008. Program Committee Member, PCM 2007, Hong Kong, China, Dec. 2007.
Review Committee Member, MMSP 2007, Crete, Greece, Oct. 2007. Program Committee Member, ICCV 2007, Rio de Janeiro, Brazil, Oct. 2007. Program Co-Chair, IMMERSCOM 2007, Bussolengo (Verona), Italy, Oct. 2007. Program Committee Member, ACM Multimedia 2007, Augsburg, Germany, Sep. 2007. Program Committee Member, ICWL 2007, Edinburgh, United Kingdom, Aug. 2007. Program Committee Member, SIGMAP 2007, Barcelona, Spain, July 2007. Program Committee Member, ICME 2007, Beijing, China, July 2007. Program Committee Member, CVPR 2007, Minneapolis, Minnesota, USA, Jun. 2007. Program Committee Member, MIRAGE 2007, INRIA Rocquencourt, France, Mar. 2007. Program Committee Member, WMVC 2007, Austin, Taxas, USA, Feb. 2007. Program Committee Member, ACM Multimedia 2006, Santa Barbara, CA, Oct 2006.
Review Committee Member, MMSP 2006, Victoria, BC, Canada, Oct 2006. Program Committee Member, ICPR 2006, Hong Kong, China, Aug 2006. Program Committee Member, ICME 2006, Toronto, Ontario, Canada, Jul 2006. Program Co-chair, Multimedia Workshop during ACM Multimedia 2006 TPC meeting, Redmond, WA, Jun 2006. Program Committee Member, ECCV 2006, Graz, Austria, May 2006. Reviewer for IEEE Trans. Automation Science And Engineering. Reviewer for ACM Trans. Multimedia Computing Communications and Applications. Reviewer for IEEE Trans. Multimedia. Reviewer for Pattern Analysis and Applications Journal. Panel Organizer, “Multi-View Imaging Data Reduction – Sampling and Compression”, VCIP 2005, Beijing, China, Jul 2005. Program Committee Member, CIVR 2005, Singapore, Jul 2005. Reviewer for IEEE Trans. Pattern Analysis and Machine Intelligence. Reviewer for Machine Vision and Applications Journal. Reviewer for ACM/Springer Multimedia Systems Journal. Reviewer for ACM CHI 2005. Reviewer for ACM Multimedia 2005. Reviewer for IEEE Trans. Image Processing. Reviewer for IEEE Signal Processing Magazine. Reviewer for EURASIP Image Communication. Reviewer for IEEE Trans. Circuits And Systems For Video Technology. Reviewer for IEEE Trans. Visualization and Computer Graphics. Publicity Chair, Int. Packetvideo Workshop, Pittsburgh, PA, Apr 2002.